I picked up Glen's book on Friday and have had fun (though it was intimidating after seeing the gorgeous images she'd created) adding to it. These are fragments of what will soon be flying on to Ronell in France :>) I've done 2 pages and just have to do the half page, where the next person - Ronell - can interact with my image. My book is on its way to Lindsay in America now with Ronell's work added - I'm dying for Lindsay to get it and show what Ronell has done with it :>) I know it's going to be gorgeous! 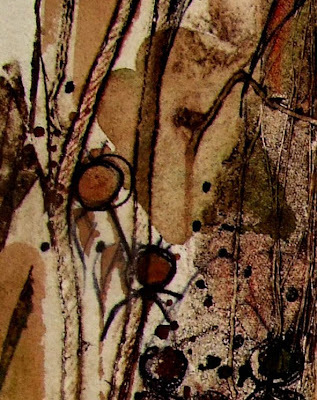 and another fragment from the other page - any idea what it's done with? I'm thinking it might be good to produce a Blurb book of ALL the images from ALL the books when we've finished - what do you think? I shall be so sorry to say goodbye to the ones that won't return to me and that would be a lovely way of keeping them all. These are lovely snippets, to be sure. A blog book would be a great idea. Love to see what's next. I forgot to say over at FPP that the blurb is a good idea! hmm. At least some of it is done with cord. The texture of the middle bit makes me think of dryer lint (a surprisingly popular choice of media in the fiber arts world). It's a lovely tease of color and texture, whatever it is. I am entranced by the exchange progress (and more than a little envious, these things always make me want to play too). .I think I see string, and what looks like rose hips . A collograph, perhaps? Or wax resist with water colour? Gee! These snippets are tantalising! But such fun, especially as I'm coordinating a similar exchange once I have the numbers of committed people. And, as some will be printmakers, we'll take your add-your-own-paper approach. some very perceptive comments there but I'm not answering them until the book arrives with Ronell!! I agree--the snippets are tantalizing: the perfect word--makes me want to see more!! 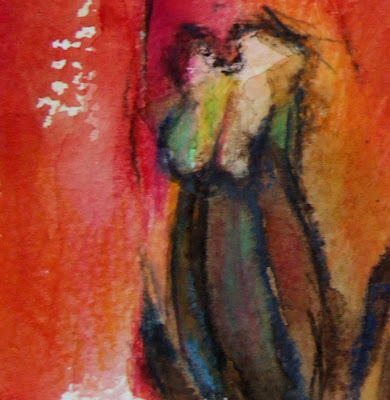 The red background is stunning and compelling, and the variety of neutrals and line in the other so elegant. I'm dying to get the next one from Glen with 3 peoples work in !